With an unsuccessful urban rail vote in 2000, and a protracted rollout of Capital Metro's commuter rail service now in the past, momentum seems to be building for rail. The project would likely cost hundreds of millions of dollars. Mayor Lee Leffingwell famously promised a vote on a bond for urban rail before the end of his term. And it seems like a week doesn't pass without a new rail proposal from the collection of city planners, transportation wonks and nonprofit advocates agitating for rail in Austin. 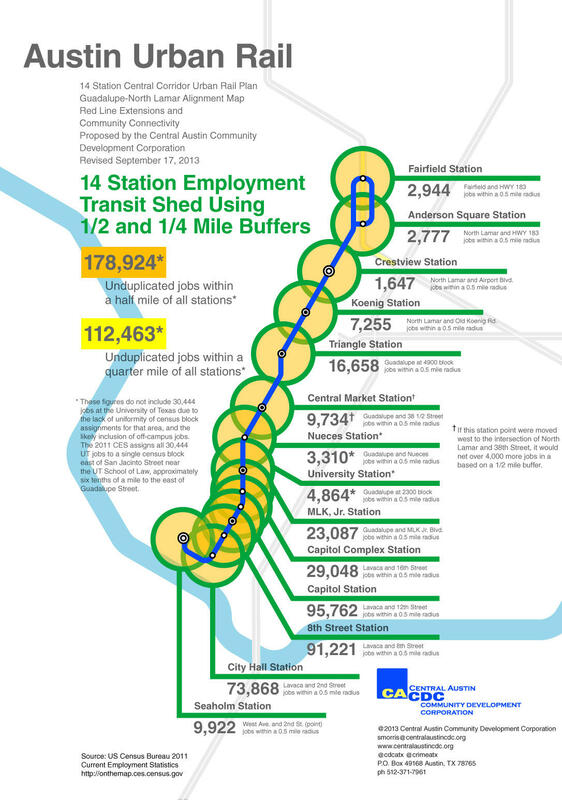 In fact, there's so many maps, KUT News has compiled them in this post: Austin Urban Rail in 7 Maps. 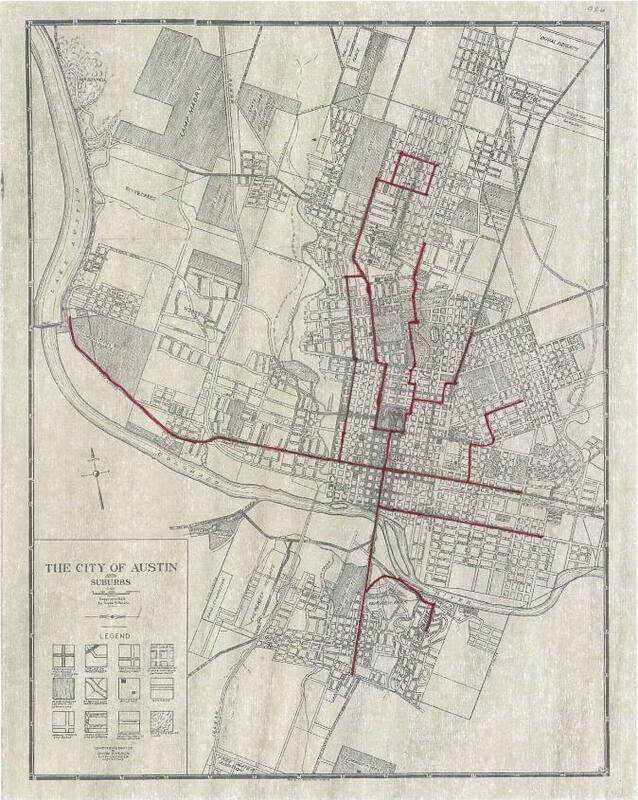 Rail isn't exactly a new thing: This 19th century map of downtown Austin highlights the routes of the city's first streetcar system, indicated in the solid red lines. The old rail lines have been pulled up and paved over, but groups want to revive the use of urban rail in Central Texas. Nearly a decade later, Austin saw its first commuter rail line open in 2010 with MetroRail—a 32-mile line from Leander to downtown Austin. Still, few definitive proposals for an urban rail service were floated until the city unveiled proposed routes for urban rail last spring. 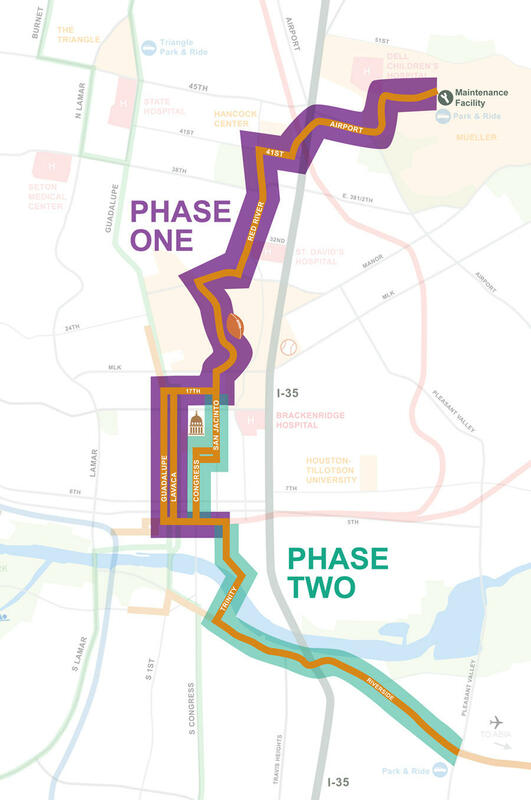 Splitting rail into two phases, the initial proposal called to run a rail line north from the Austin Convention Center downtown, through the UT-Austin campus, and on to the Mueller neighborhood. City planners have argued the nascent Muller neighborhood, with its mix of residential and business uses and space for a rail yard, was a natural terminus for the line. But several local transit advocates chafe at the idea of a Mueller alignment. Scott Morris and his team at the Central Austin Community Development Corporation are building a case arguing the rail line should serve an already densely-populated area. Working from 2010 Census data, Morris projects the Guadalupe-North Lamar alignment would be much closer to thousands more users. On its website, the CDC says "it has a 4 to 1 advantage in number of residents against Mueller alignment. … If built, the Guadalupe North Lamar alignment would put tracks within a ten minute walk of over 31% of all jobs in the city." 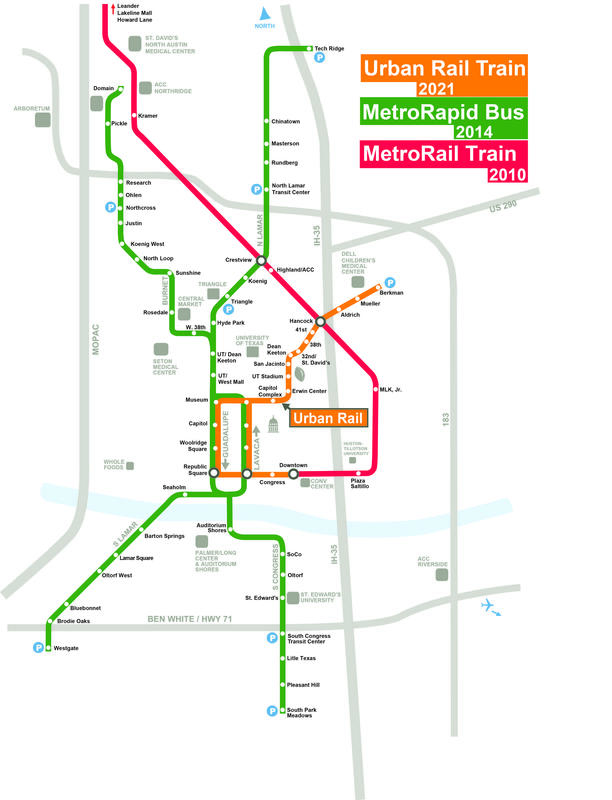 A similar map proposing a “loop” comprised of new urban rail and existing MetroRail service is online at Austin Rail Now. While the CDC is concentrating on a route, urban rail is also seen as part of a larger, regional transportation system. 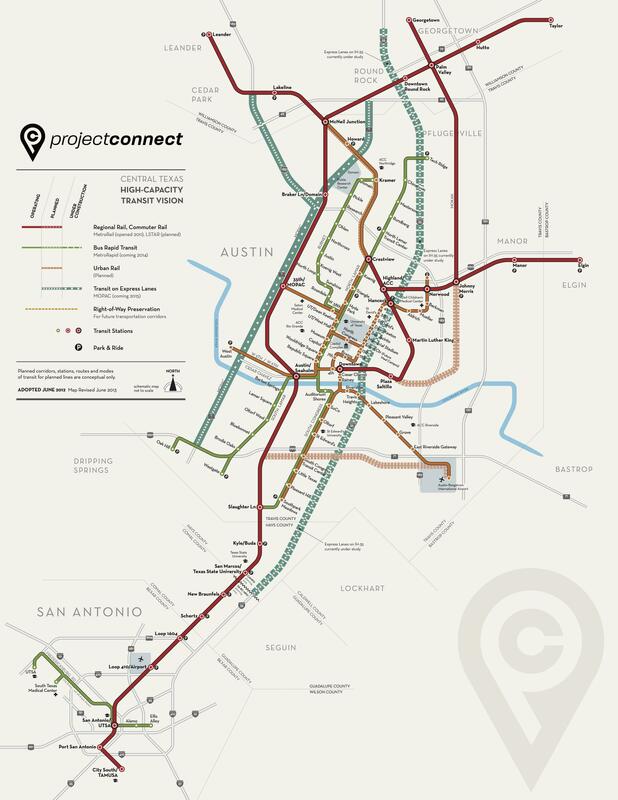 Another proposal in an integrated regional system consists of a line connecting several cities in Central Texas, including San Antonio, Austin and Round Rock. 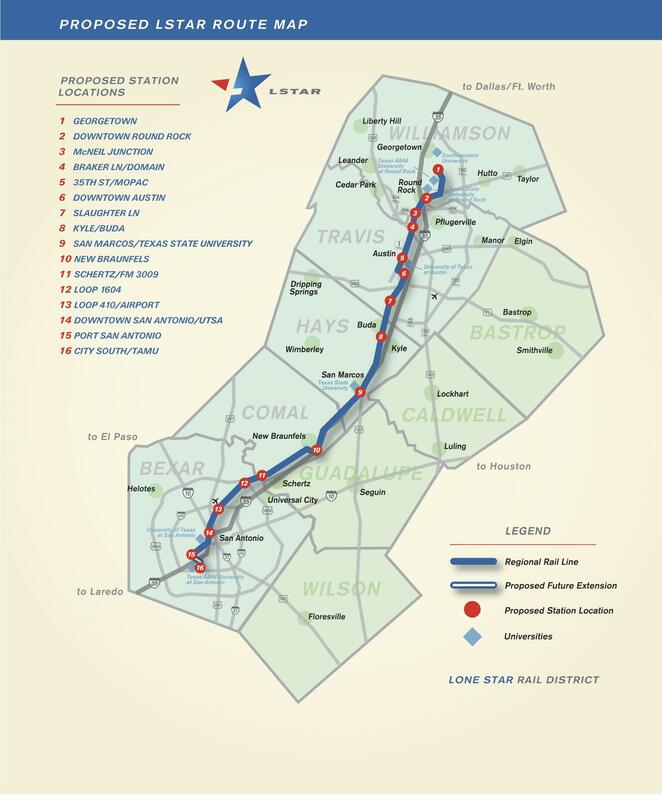 The Lone Star Rail District is the group leading the planning effort to connect Central Texas cities. Austin and San Antonio officials are in talks with the Department of Transportation about federal dollars to help fund the project. 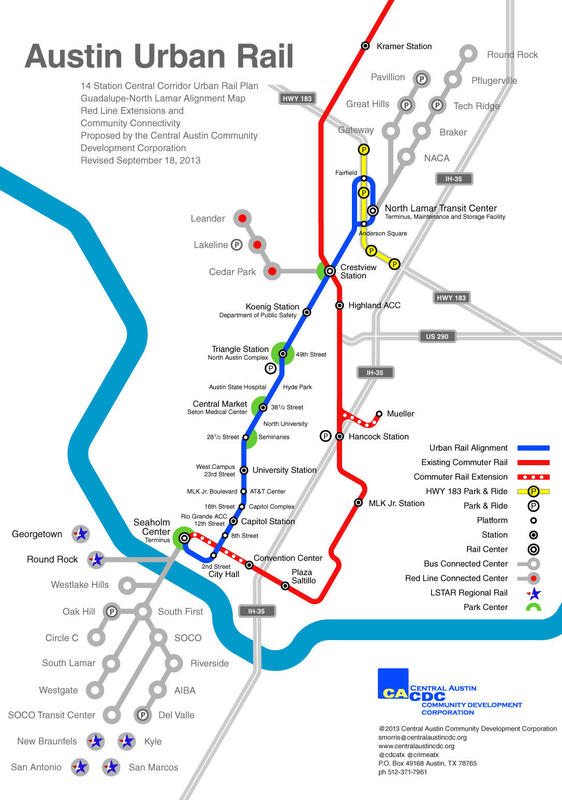 Ultimately, Project Connect's strategy envisions connections between regional rail, urban rail, commuter rail and rapid bus. While debate continues over what's the right alignment for urban rail, the overall vision of efficient transportation for a rapidly growing community is a shared vision. Project Connect is holding five meetings looking at transit options within the Central Corridor. It defines that area as bounded by RM 2222 to the north, Oltorf Street to the south, Springdale Road/Grove Boulevard to the east, and MoPac to the west. “Approximately 269,000 commuter trips are made into the Central Corridor each weekday, with an additional 47,000 commuter trips taking place within the corridor itself,” according to a Project Connect. Wednesday, Sept. 25, 5 – 8 p.m.
Thursday, Sept. 26, 11:30 a.m. – 1 p.m.
Thursday, Sept. 26, 5 – 8 p.m.
Friday, Sept. 27, 12 – 1 p.m.
Wednesday, October 2, 5 – 8 p.m.